Rage is supported by a number of online resources, many of which can be found in the links at the top or to the right. # Keyword definitions (part of rules). # Rage FAQs: examples, cards-specific situations and card errata. # Rageinfo, the Rage mailing list. # Rage group on Live Journal. # River Von, home of the fan sets, with assorted other resources and links. # Rage plugin for MSE - Make your own Rage cards. Welcome to the world of Rage, where the werewolves (also known as Garou) are fighting a losing battle against the forces of corruption (the Wyrm). These tribal warriors are ferocious in battle, but there are many battles to fight, and the Garou's forces also turn on each other in frustration. It is a time of desperation, a time of despair ... and a time for great heroes to do great deeds! The battle howl has sounded! When Will You Rage? Rage was first produced as a Collectible Card Game (CCG) in 1995, based on the first edition of the Werewolf: the Apocalypse roleplaying game. This version of Rage is known as Rage: Apocalypse. Five sets of cards were printed by White Wolf. Since then, fan sets have been produced with permission of White Wolf, available as printable PDFs from River Von. These fan cards are generally divided into blocks of sets and include: the New England block; the beginning of the Ahadi block (set in Africa); and Least Wanted (18 cards remade because they were overly broken or confusing). Each player has a pack who are trying to prove that they are better than the other packs. They achieve this by earning Victory Points (VP). The main method of acquiring VP is by killing prey or members of other packs, but packs can also gain VP from Quests, calling and winning votes and by other means. As well as the Characters they start with, players have their combat deck (used to kill creatures - or prevent death) and their sept deck (which contains resources, game altering cards and alternate methods of getting VP). Packs can serve either Gaia or Wyrm. Both allegiances play using the same rules but, because they draw on a different pool of cards, they can play quite differently. Rage is supported by a number of online resources. http://www.werepenguin.com/rage/rules/keywords.html - Keywords definitions (part of rules). 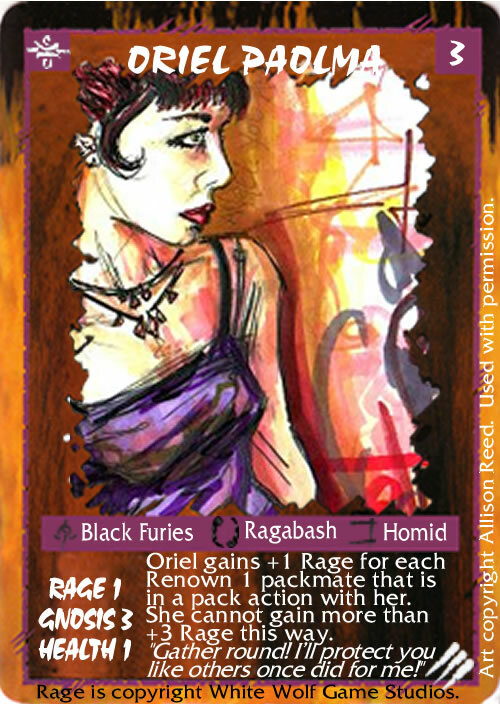 http://www.werepenguin.com/rage/rules/FAQs.html - Rage FAQs: examples, cards-specific situations and card errata. http://games.groups.yahoo.com/group/rageinfo/ - Rageinfo, the Rage mailing list. http://community.livejournal.com/rage_ccg/ - Rage group on Live Journal. http://www.rainydaypaperback.com/rage.html - River Von, home of the fan sets, with assorted links. http://mtg.pifro.com/viewtopic.php?f=20&t=468 - Make your own Rage cards. http://www.littlebearslore.com/ - Alternative database, only contains printed cards. The Pack Home Ground is where your pack spends most of its time. It includes all members of your pack, their pack resources and their Pack Totem. All pack members within the Home Ground are available for pack actions, and can use pack resources and the pack totem. All of a player's decks, discard piles and their Victory Pile are considered to be in the Pack Home Ground. 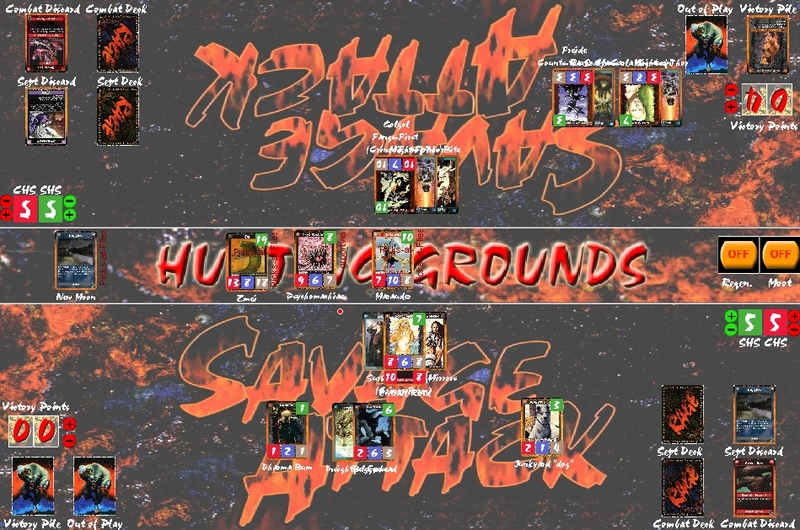 The Hunting Grounds is the area in the center of the playing field between all of the players' packs. Enemies and Victims residing in the Hunting Grounds are waiting for Characters to goad them into battle. Alphas are not considered to be in the Hunting Grounds, nor do they enter the Hunting Grounds when fighting other opponents. Characters temporarily in the Hunting Grounds are away from their pack (see Stepping in) but are still controlled by the same player - only that player can use the Character and play cards for it. The Character may still equip, use Rites or Gifts and attempt Quests. Such Characters can be attacked by Alphas as their Alpha action. The Umbra is the spirit world, a dreamlike reflection of the physical world that runs parallel to it. Packs may use the Umbra for a specific purpose, as an alternate fighting ground or to try and elude their foes. A section of the Hunting Grounds and each player's Pack Home Ground should be designated as an Umbral zone where creatures in the Umbra are placed. Alternatively mark creatures in the Umbra with a token of some sort. A player's Victory Pile is the record of the earned renown of the pack. Any kills the pack makes in combat are placed in their Victory Pile, unless they are not worth any VP (e.g. Victims killed by Gaia packs) in which case they are discarded. Card abilities may place other cards in a player's Victory Pile. Creatures placed face up in your Victory Pile are always worth their printed Renown in VP, unless a card changes the amount of VP awarded. Cards are placed in the Victory Pile face up, unless a card ability says otherwise. Face down cards in a Victory Pile are always worth 1 VP. If a creature is killed outside of combat, they are not worth any victory points. Characters killed in this way are removed from the game. Other creatures are simply discarded to their owner's sept discard pile. Any player may inspect the contents of a player's Victory Pile at any time. Unique cards in a Victory Pile do not prevent a copy of that card from being played - cards in the Victory Pile are considered not in play. Certain abilities will temporarily place a creature out of play (also referred to as removing it from the game). The card which removed the creature will specify the duration. Cards that are Out of Play are not considered to be in either the Umbra or the Physical World. While out of play, creatures cannot be targeted by any card or ability, cannot take any actions, cannot use their special abilities and cannot enter combat. Such creatures can still regenerate, and Characters and Allies are still considered to be part of their pack. Creatures in the Out of Play area are still counted present for and affected by global effects (such as a Wyldstorm), even if they would change move the creature out of the Out of Play area. Any cards attached to an out-of-play creature (e.g. equipment) are also out of play. Any other card that is placed temporarily out of play is not affected by anything except global effects (and similarly such cards affect global effects (e.g. Cataclysm)). The abilities on any out-of-play cards cannot affect the game. Cards that are out of play are still checked for uniqueness and similar restrictions - you cannot play a copy of a Unique Fetish that is currently out of play. Cards removed permanently from the game are not considered for Global Effects or Uniqueness (or similar restrictions). A period of the game where only specific plays can be made. A period of the game where Open Play cards and abilities can be used. Not Closed Play. 1. For members of a pack: any card or ability which could affect a card in the Hunting Grounds or another pack, including Unique cards (e.g. Body Wrack, Spiritual Revelation). 2. For creatures in the Hunting Grounds: any card or ability which does not target the creature that played it. Most Rage games pass too quickly to be absolutely thorough with your timing. However, if you do play an Offensive Effect without following correct timing procedure - especially if you do not have their attention - they are well within their rights to say, "Woah..." and play stuff on their own pack. Similarly, if a player moves between Open Play and Closed Play before you are ready, you can ask them to take their actions back. Consistently leaping ahead when your opponents are not ready could be taken as cheating (although generally Rage is a friendly game). It is bad etiquette, if another player asks if you are ready for him to play an Offensive Effect, to stay silent: if you are thinking, you should say so. Nor should you disturb your opponent if they are clearly playing cards or using abilities at the time. gEngine etiquette: it is suggested that players make use of the OK? and OK buttons to see if your opponents are ready for your Offensive Effect. If a situation arises in which a past play condition would have been affected by something a player or Character has in play but failed to take into consideration, too bad. For example, if you engage a spirit in combat with a piece of Equipment that reduces a spirit's Rage and you forget about it, that spirit will still fight you at full Rage. Complaining after the fact won't help a bit. Pay attention to the game. Cards or abilities who override timing rules with their text (e.g. Distractions, No Escape). Each phase starts with a period of Closed Play. There is no Open Play before these periods of Closed Play. Steps 1-6 of each combat round are Closed Play and the Declaration and Pre-Combat steps during combat declaration are also Closed Play. Any period of play which is not Closed Play is Open Play. During Open Play, players may use Open Play cards, abilities that are appropriate and, in combat, Combat Events. During Open Play, you may play sept cards or use the abilities on sept and character cards at any time it is appropriate (according to the card type and effect). However, any time you play any an Offensive Effect (see definition above), YOU MUST HAVE THE ATTENTION OF ALL OTHER PLAYERS. Before you play an Offensive Effect, you must announce your intention to do so (without specifying any details, including the name of the card used/played). In response to this announcement, any player may play cards and/or use abilities that only affect or target their own pack. Only when all players are ready do you play your Offensive Effect (you may choose not to). There can be multiple Offensive Effects declared at the same time, but each player may only declare one Offensive Effect at a time. Resolve each Offensive Effect in the order players asked to play them. If players announce they wish to play an Offensive Effect at the same time, decide randomly which player goes first. Note that if combat starts, existing Offensive Effects declarations are ignored until combat resolves. Bringing into play a Unique item (or once per game item), or using an ability which might put it into play, counts as an Offensive Effect if used in Open Play. Abilities which cancel other abilities/cards interrupt the timing sequence and may always be played in response to the ability/card they are cancelling. If it is cancelled in this fashion, the cancelled card or ability never resolves. Cancellers may also be used later, to cancel abilities or remove cards with permanent or ongoing effect, but cancelling this way is not retroactive: when abilities/cards are cancelled this way, effects they may have had previously are not reversed (e.g. cancelling Eye of the Cobra after the user has traded all the equipment from the Character they borrowed does not restore the equipment to the target). Rage does not use expendable resources. If you meet the requirements to play a card (e.g., a Combat Action or a gift), it does not count against rage or gnosis later in the turn. Some cards require prerequisites before they may be played. If you successfully meet the requirements of a card and bring it into play, you do not have to keep meeting the requirements for the card to remain in play. For example, if you recruit an Ally that requires a Theurge in your pack and the Theurge later dies, the Ally does not leave the pack. Likewise, if a creature's Gnosis drops below the Gnosis requirement of a Fetish/Bane Fetish, the Fetish/Bane Fetish continues to work (Equipment has more detail). Cards in Rage do not have "card memory". Each card is independent of any other copies of that card, either in play or played previously. A card which can only be played once per game can still only have one copy of it played per game, but a card which has a one-use ability (e.g. Don Campisi) may use its ability even if an earlier copy of the card has already done so. Likewise, abilities that target one copy of a card only affect that copy - if you play a Nemesis on Golgol and Mamu, it only affects one distinct copy of each, not all Golgols and Mamus in play! When the text on a card conflicts with these rules, the card takes precedence. These rules are a simple skeleton for the game's mechanics; the cards are the special circumstances that allow you to break the rules (temporarily). The most recently produced version of a particular Rage card (not including those produced for Rage Across Las Vegas) is considered correct. Any errata is considered to replace or supplement the most recent printing of the card. At the beginning of the game, all of the players decide the Renown level that they wish to play. The Renown of all of the Characters in a single pack must be less than or equal to the Renown level of the game. Also, the Renown level dictates how many victory points are required to win the game. Players wanting a shorter game should choose a low Renown level; players wanting a longer and more involved game should choose a higher Renown level. The standard Renown level of the game is 20. Cards should be separated according to their types: combat, sept and Character. A player must have a minimum of 20 combat cards (maximum 2 of each card) and 30 sept cards (maximum 3 of each card), but there is no maximum deck size. Shuffle the sept deck, then shuffle the combat deck. A player may have any number of Characters as long as their Renown total does not exceed the Renown level of the game. Characters should be set out breed form up (their "normal" form - i.e. not Crinos or Battle form; some Characters only have one form and are the same on both sides of the card). The default hand size for both sept hands and combat hands is 5 cards. If a player's sept hand size is increased or decreased for any reason (e.g. Old Storm Chaser), when their player (re)draws their sept hand they draw to the adjusted sept hand size instead. Similarly with an altered combat hand size. Rage is played by all players simultaneously. Everyone shares all of the Phases and is considered to be acting at the same time. The only exception to this rule is the Combat Phase, in which Alphas act in descending order of Renown. Thus, all players redraw at the same time, go through the regeneration phase at the same time, etc. The rest of this Chapter describes the contents of the turn phases. While it summarises how cards are played within the phases, more detail on cards use can be found in the following chapter. Closed Play. In the first Redraw Phase of the turn, all players draw their first sept hand (equal to their sept hand size). They also draw their first combat hand (equal to their combat hand size). No actions can be taken until all players have drawn these cards. Closed Play. During each following Redraw Phase, players may discard any cards from their sept hand that they wish to (up to their whole hand) and then draw enough cards to fill their hand to their sept hand size. Once players start discarding and redrawing, nothing can interrupt this process until all players have refilled their sept hand. If a player's sept deck is depleted, he does not draw any more cards but is otherwise unaffected. Open Play. The rest of the phase is Open Play. Any cards which state that they may be played "at the beginning of the turn" can only be played during redraw phase (e.g., Moon phases). The term "At the beginning of the turn" is functionally identical to "during Redraw Phase". Closed Play. Shapeshifters, the hardy creatures that they are, have remarkable powers of healing. At the beginning of the Regeneration Phase, all regenerating creatures return the single non-aggravated lowest-damage card attached to them (if any) to the original owner's appropriate discard pile. Where there is a tie, the creature's controller (or prey's owner) decides which is discarded. No action can be taken or card played during this phase until all regeneration is completed. Allies, Enemies and Victims do not, as a rule, regenerate. Very few do, and these are marked with the note (regenerates) at the bottom of their statistics. Exception: All shapeshifters (were-critters) and vampires regenerate, even if it is not indicated on the card. "At the beginning of the Regeneration Phase" means in Closed Play, before regeneration occurs. Open Play. The rest of the phase is Open Play. Closed Play. At the beginning of this Phase, players may play creatures (Allies, Enemies and Victims) and resources (Caerns, Equipment, Realms and Territories). Note that a player must have a Character in the Umbra to play a Realm, and Characters must be in the same world as the Ally they want to recruit. Prey (Enemies and Victims) are played to the Hunting Grounds. Equipment is played on (and attaches to) a Character or Ally that meets the requirements. Other resources are pack resources and are played to the Pack Home Grounds. All resources played during Closed Play are considered to be played simultaneously, and their effects do not take place until Closed Play is finished. If any Unique card is played by more than one player during Closed Play, the person who may keep it is randomly determined (all extra copies are returned to their player's sept hand). "At the beginning of the Resource Phase" means in Closed Play, before Resources are played. Open Play. The rest of the round is Open Play. Players can still play creatures and resources, but they are not considered to be played simultaneously. Use Open Play timing instead. Equipment may also be traded to another Character or Ally that meets the requirements during this phase, although only once per item (see Equipment). NOTE: In the first printings of Rage, the Resource Phase was called the Equip/Ally phase. The two are identical terms. Closed Play. At the beginning of the Umbra Phase, Characters may use a Caern to step sideways into or out of the Umbra. Only Characters that can normally step sideways can use the Caern in this fashion (see Creature Class). To enter (or leave) the Umbra, the Character's Gnosis must be greater than or equal to the Gauntlet of the Caern. All creatures stepping sideways this way enter or leave the Umbra simultaneously, and a Character cannot use the Caern twice in the same Umbra phase to both enter and leave the Umbra. The Character can use other means of moving into or out of the Umbra without restriction. "At the beginning of the Umbra Phase" means in Closed Play, before creatures use Caerns to step sideways. NOTE: In the first printings of Rage, the Umbra phase was part of the Moot Phase. This section assumes understanding of allegiance. Characters may call (play) Moots or Board Meetings at the beginning of the Moot Phase. In order for a Moot or Board Meeting to be called, there must be at least two players in the game playing packs of the same allegiance (i.e. at least two players must be playing Gaia packs before any Moots may be called and at least two players must be playing Wyrm packs before any Board Meetings may be called). Juntas may not target creatures or other cards that are only in the Umbra. Otherwise the effects of Juntas work equally in both the physical world and the Umbra. Creatures that are only in the Umbra may not call or vote in Juntas. Characters have a number of votes equal to their Renown and can use those votes in every Junta they are elligible to vote in. Juntas are voted on in order of Renown and, if they pass, resolve immediately. See Juntas for detailed timing. For full details see Combat. Combat ends when the attacker withdraws, a round passes in which no combat cards are played or a card ability ends it. Closed Play. At the beginning of the Combat Phase, players may discard any cards from their combat hand that they wish to (up to their whole hand) and then draw enough cards to fill their hands to their combat hand size. As in the Redraw Phase, discarding is done before redrawing and no actions may be taken before all players have redrawn their combat hand. If a player runs out of combat cards, simply reshuffle the discarded ones and proceed as normal. Open Play. Each player then selects a Character or Ally from their pack to be their alpha, the pack member who will represent its pack during the current Combat Phase (players must pick an alpha if possible). The player then pushes the alpha to the forefront of the pack. If, during the course of the Combat Phase, that alpha is killed or otherwise lost, the player may not select another until the next Combat Phase. A player may select a different alpha every combat phase, or use the same one repeatedly. "At the beginning of the Combat Phase" means in Open Play, before alphas are chosen. Werewolves - in fact most of Gaia's shapeshifters - defer to their elders, while the Wyrm's minions cower before those more powerful than them. As such, the alpha with the highest Renown takes his alpha action first (ties are decided randomly as soon as all alphas have been selected). Once the first alpha has finished their alpha action, the alpha with the next highest Renown takes his action, and so on. Attack any other alpha in play. Attack any Enemy or Victim in the Hunting Grounds. Attack a Spirit in the Hunting Grounds to bind it. Issue a challenge to a non-alpha pack member in play. That pack member may refuse at his option. See Combat for details of how attacks work. At the end of any Combat Phase, if a single player has accumulated Victory Points (VP) equal to or exceeding the Renown level of the game, he has won. If two or more players have equal to or greater than the Renown level, the player with the most VP wins. In the event of a tie, the game continues for another turn (and more, until there is a clear winner). A player that has lost all of their Characters is out of the game. All cards in their Pack Home Grounds, other than their combat deck and discards, are immediately removed from play; any cards he has in play outside of his Pack Home Grounds remain in play. The player may no longer play any sept cards. They may play combat cards for Prey in the Hunting Grounds. If the player has gained enough points to win on the turn he is taken out, he still wins, as his pack's heroic actions are still remembered in the tales of the Garou. A player with no pack may not be targetted by cards that affect packs, Victory Piles, etc. Rage is played with three different kinds of cards: Characters, sept and combat cards. Rage was derived from a roleplaying game and it shows in terminology. Although clearly all cards are played by players, when a card requires a creature to meet its requirements before it can be played, that creature is deemed to play that card. Similarly, some cards say "you" do something. Very often, especially on Combat Actions, it refers to the creature playing the card (generally we don't encourage our players to "tear some fool in half"). Character cards are the two-sided cards which represent the individuals in the game. One side of the card depicts that Character's breed form, the form in which he goes about his daily business. The other side illustrates the Character's Crinos - or battle - form, which is his combat ready killing machine form. Note that on some Characters, statistics do not change and their artwork remains the same; these Characters' breed and battle forms are one and the same. All Characters are considered Restricted (each player may only put one of a given Character in their deck, but the same Character may appear in any number of packs). Note: if there is no glyph in the upper left corner, the card is for a different game, called Rage Across Las Vegas or Rage: Tribal War. The two games are not compatible. Tribal War Character cards also have a pawprint at the bottom, and the upper left indicates the Character's form. Like you don't know what a name is. Each release of Rage has a glyph in the upper left-hand corner. This glyph indicates which expansion the card is from. A Character's Renown is a reflection of how well-esteemed and able-bodied the Character is, and it dictates the amount of Victory Points that the Character is worth when killed. The Renown level of the game is also the limit of the combined total renown of your starting Characters. Rage defines the combat prowess of the Character. Gnosis indicates the level of her spiritual attunement. Health reflects the Character's ability to withstand combat. Characters who regenerate, but whose creature class does not necessarily regenerate, have "(Regenerates)" written beneath their Stats. Gaia Gaia Characters defend Gaia by cleansing the world of the Wyrm. They may only be put into Gaia packs. Wyrm Wyrm Characters seek to destroy or corrupt the world around them. They may only be put into Wyrm packs. Rogue Some Rogue Characters are torn between their duty to Gaia and the lure of the Wyrm; other Rogues merely have an agenda that crosses into both camps. Rogues may be put into either Gaia or Wyrm packs. Rage is a game of Gaia's servants against those of the Wyrm. When creating a deck, choose an Allegiance: Gaia or Wyrm. All Characters put in the deck must be of that Allegiance, the resulting pack will always have that Allegiance and any Allies in the pack will also have that Allegiance. Allegiance, like keywords, determines which cards creatures can play and benefit from. Gaia creatures can use Moots and Fetish equipment but not Bane Fetishes or Aspect Gifts. Wyrm creatures can use Board Meetings and Bane Fetish equipment but not Fetishes, Auspice Gifts or Breed Gifts. Additionally, Gaia packs cannot use Wyrm totems and Wyrm packs cannot use Gaia totem. Card abilities can overide these restrictions. Creatures which change pack, either temporarily or permanently, lose their old Allegiance and gain the Allegiance of their new pack (if they change pack again - including returning to their original pack - their allegiance may change again). All Enemies are considered Wyrm creatures. All Victims are considered Gaia creatures. Creatures who change Allegiance retain their Fetish/Bane Fetish equipment but cannot use it if they are now of the wrong Allegiance. Rogues were introduced in Ahadi, although Conrad Walks-the-Line from Legacy of the Tribes counts as a Rogue. Rogues may be used as either Gaia or Wyrm Characters during deck construction, although no pack may start with more than half their Renown consisting of Rogues. There are no Rogue affiliated packs - packs can only be Gaia or Wyrm. Once a game begins, Rogues gain the allegiance of their pack. They do not change creature class or tribe, and retain use of all their keywords, but follow the restrictions of their pack's allegiance (as above). So a Rogue Wendigo in a Wyrm pack becomes a Wyrm Character and could use Bane Fetishes and Wendigo Gifts but not the War Lodge (a Fetish); it does not become a Black Spiral Dancer. Rogue Characters do not have Aspects, although they may gain them through card abilities. Characters from older sets, who do not have an Allegiance Glyph, have to be identified by creature class and faction. All 7th Generation, Pentex, Black Spiral Dancer and Bane Chararacters are Wyrm affiliated, as is any Character with a Wyrm Aspect listed (e.g. Morgan, Count Vladimir Rustovich). All other Characters, with the exception of Conrad, are Gaia Characters. When learning Rage, we suggest that you only use Garou (werewolves) and other Gaian shapechangers such as Mokole and Bastet who normally can frenzy, regenerate and step sideways. Each Character has keywords which define its creature class, faction, breed and spiritual role. These keywords are mostly found on the coloured strip above the Stats and Text Box, but additional keywords can be found at the beginning of the Text Box, a word or expression followed by a full stop (e.g. "Eater-of-Souls." or "Kailindo."). All keywords dictate which cards the Character can play or benefit from (for instance Kiss of Helios requires an Ahroun, while Ahrouns get an extra benefit when a Full Moon is in play). Additionally, the creature class determines whether the Character can Frenzy, Regenerate or Step Sideways. Where a creature has more than one creature class, it has the abilities of both (e.g. an Abomination - Garou/Vampire - can step sideways because a Garou can step sideways, although a Vampire cannot). Keywords: Additional keywords. These cannot be blanked or changed unless a card refers to keywords explicitly. Special Ability: Characters have unique benefits or flaws explained here. Flavor: Text which is neither a keyword nor a rules effect is flavor, and has no affect on the game other than to enhance its mood. Additionally, most creatures carry an indication of their gender in their flavor text and special ability, and sometimes their creature class. The breed form is the natural form of the Character (normally Homid or an animal form), indicates the Breed of the Character (see keywords) and is the form that the Character starts the game in. In most cases, breed-form stats are lower than crinos-form stats. Most Characters are able to transform into a battle form, which is represented by having two-sided Character cards. One side is the Crinos (for Shapeshifters) or Battle form (some Wyrm Characters). To all extents and purposes these two forms are the same and the terms are synonymous. The other side of the card is the breed form, which varies from creature to creature. Changing between forms is represented by flipping the Character card. Some Character cards are the same on both sides. In this case they only have one form and cannot change forms. Creatures who changed to Characters during the game cannot change forms. Several Characters have versions at different renown levels. These Characters are more (or less) experienced versions, and may not be in the same pack as one of their earlier incarnations. For example, Renown 8 Mari Cabrah may not be in the same pack as Renown 6 Mari Cabrah. Why? Because they're both Mari Cabrah! Similarly, Lord and King Albrecht are versions of the same Character as are Questor Treetalker and Questor. The Silver Pack is elected at the grandest of Garou moots, and they are a representation of the first pack. Usually Silver Packs number between five and 10 members, but there is always at least one member of each auspice. Characters who are members of the Silver Pack will never attack another member of the Silver Pack; they are considered to have a loyalty to each other and can never be made Rivals of each other. At times, a creature's Rage, Gnosis, Health or Renown scores are modified in some manner. For instance, Rage is frequently modified by combat actions, and Renown may be increased or doubled in moots by various abilities. In all cases, any multipliers (i.e., doubling) are applied first, then additions or subtractions. A card abilitiy (for instance, a firearm) that says "May play Rage X cards" does not give a creature a Rage of X. For instance, if a Character with a natural rage of 2 has a Shotgun (giving her the ability to play Rage 7 combat actions) is influenced by a Battle Song (+2 Rage), she does not gain the ability to play Rage 9 combat actions. Instead, she is now a Rage 4 Character with a shotgun. Also, any card that lets you play Rage X combat actions also allows you to play combat actions of less Rage (so you can play a Rage 6 card with a Shotgun). No statistics have upper limits. Rage and Gnosis may never be below zero after all modifications. Any creature with a Health modified to zero is dead. Renown modifiers on a creature never change the amount of VP that they are worth. Other abilities may do so (e.g., Scar Throat's +2 VP for Vampires). Sept cards are the resources of the Characters in your pack and game altering cards. The sept deck includes the Equipment, special powers and other benefits that the Garou may draw upon. There are many different types of sept cards. Once you are out of sept cards, you may continue to play, but you will obviously not draw any sept cards during the Redraw Phase. Creatures may never have more than one copy of any sept card attached to them, unless it is a damage card. Each player can only play one of these per game. If the card is cancelled it still counts as played. Only one copy of each Unique card may be in play at the same time. A player may not play a Unique card if a copy of it is already in play. If more than one player tries to play the same Unique card at the same time, randomly determine which player plays the card (return other copies to their owner's hand). A second copy of a Unique card may be played once the first one leaves play. Cards in Victory Piles do not count when testing for Uniqueness, but cards temporarily removed from play do. Unique, Restricted, Combat Restricted or with any other limitation on how many times the card can be played (or how many can be in play at once). Resources are a class of sept cards that represent permanent fixtures that benefit a pack. They last until they are destroyed or you no longer want them. There are various types of resource but they share common rules. All resources can only be played during the Resource Phase. This takes an action by one of your Characters (or Allies for equipment). All resources have one or more requirements (keywords) listed, and the Character playing the resource must meet one of those requirements. Note that cards can also contain additional conditions in the text box which must be met (e.g. the user must be a Character or be in Homid form), meeting or ignoring the keyword requirement is not enough. These additional conditions are not considered keyword requirements. All resources can be voluntarily discarded from play during the Resource Phase. This does not require an action. All resources other than Equipment are considered pack resources: they are played to your Pack Home Ground and their use is not restricted to the creature that played them in any way. Caerns are mystical places of power for the Garou; they provide doorways between the physical and spirit worlds, and allow most Characters to step sideways. A pack may only have one Caern in play at a time and all named Caerns are Unique. Caerns exist on both sides of the Gauntlet and can be played by a creature either side of the Gauntlet. While Caerns primary use is to allow pack members to step into the Umbra and back, all members of the pack can use and benefit from the Caern's special ability, even if they cannot step sideways. For more information on using Caerns, see Umbra Phase. But I don't know what it does! Equipment, Gift and Rite cards have text on one side and art on the other, so when you attach them to (place them under) a creature you can see the beautiful art. However, while you are learning the game you will probably want to place them under the other side of the creature so you can see the text (but not the art). Equipment grants additional abilities to the bearer. When played, equipment is attached to the creature that played it, placed under the character so only the side of the card with the art is showing. Only the creature carrying the equipment can use its benefits and abilities (although some equipment has effects beyond the creature using it). Creatures can choose not to use equipment attached to them. A creature may only have one piece of Armor and one Weapon at a time. Characters and allies may also trade or give Equipment (items) to another member of their own pack, or to a member of another pack if they agree. This can only be done during the Resource Phase but each item may only traded once per Resource Phase. This is an action for the creature receiving the equipment, but not for the one giving it up. The creature receiving the equipment must also meet its requirements or it is discarded. Prey cannot normally be given Equipment, but if a creature receives equipment while in a member of a pack and later enters the Hunting Grounds they do not lose the equipment and can continue to use it (see Prey using Gifts). Equipment can be played by Allies providing they meet the requirements. If a creature acquires equipment that it does not meet the requirements for, the equipment is discarded; if a creature no longer meets the requirements of equipment already attached to it, the equipment is not discarded. Creatures can always use equipment attached to it, unless it is a Fetish owned by a Wyrm creature or a Bane Fetish owned by a Gaia Character - in this case the equipment cannot be used until the user changes allegiances or trades it (card abilities can override this). Where equipment states that it can only be used in certain forms, this does not express a condition to play the card. A creature equipped with a weapon is assumed to be using that weapon unless the player specifies otherwise (for instance, to use Razor Claws, he cannot use a weapon). If the creature is equipped with multiple weapons (through a special card ability), he must select which weapon he will use by default when the second weapon is equipped. He may announce a weapon change at the beginning of a round of combat (during any play-card step). A creature with two weapons cannot play an extra Combat Actions because of this. Equipment is divided into Fetishes, Bane Fetishes and mundane equipment. The mystical items known as Fetishes can only be played by Gaia Characters and Allies. Fetishes list a minimum Gnosis score for a creature to play them, as an additional requirement. Bane Fetishes are the Wyrm's equivalent, empowered by Banes rather than Gaian or Wyld spirits. They can only be played by Wyrm Characters and Allies and are not considered Fetishes. Bane Fetishes list a minimum Gnosis score for a creature to play them, as an additional requirement. Mundane equipment (also known as Non-Fetish or Techno equipment) includes more normal items such as guns and can be identified by the fact that they do not have a Gnosis requirement. Many mundane items have restrictions on their use. Certain Fetishes are also Bane Fetishes - they may be used by any Character or Ally, Gaia or Wyrm, and are affected by cards which affect either Fetishes or Bane Fetishes. Certain creatures automatically have equipment ("built-in equipment") - for instance, the Kinfolk Soldier of Fortune has a shotgun. These pieces of equipment may never be traded away. If the equipment is somehow disarmed, stolen or destroyed during combat, the creature no longer has access to that piece of equipment for the duration of the current combat. After combat, they automatically get a new copy of that equipment. If the built-in equipment is stolen or disarmed while the creature is not in combat, there is no effect - the creature immediately rearms itself. Creatures with built-in weapons cannot be given other weapons. Realms represent pocket dimensions in the Umbra with different laws of reality. When one is played for your pack, a pack member has been to that Realm, and returned with new knowledge or power that helps them for the rest of the game. The abilities of a Realm apply to both the physical world and the Umbra. A pack may only have one Realm in play at a time. All realms are Unique. You must have a Character in the Umbra to play a Realm. If at any time, you have no Characters in the Umbra, you must discard any Realms you have in play. Realms without requirements listed require a Gaia Character to play. Territories are special places that packs control and benefit from. They are similar to Caerns, though they are not as spiritual in nature and not as well hidden. Territory cards are instantly recogniseable as they are layed out landscape rather than portrait. Packs may have any number of Territories, even multiple copies of non-Unique Territories, in play at any point. Using the special ability of a Territory is not considered an action, and may be done at any time unless otherwise specified. Territories exist on both sides of the Gauntlet and can be played by a creature either side of the Gauntlet. There are special rules for attacking Territories. If you recruit an enemy or victim into your pack, it still retains all card text. For instance, if you pull a Progenitor Mage into a Wyrm pack, it will still attack at the end of the combat round, and you would get points for anything the Mage killed. While they are part of your pack, they are considered your Allies, not Enemies or Victims, so if they they are worth their full VP to anyone who kills them. Those that normally attack Characters will not target your Characters with their automatic attacks. As a corollary, a creature is either a Character, Ally, Enemy or Victim. If something causes a creature to change its status, the creature is no longer its original type. For example, a Character who is voted a Skindancer is now an Enemy, and all relevant rules for enemies apply to it. Therefore, it may no longer frenzy (since only Characters can frenzy), but a Wyrm alpha may step in to defend it if it is attacked. Abilities which change a creature's status cannot be used during during combat. Characters are not the only creatures that appear in a game of Rage. Allies and Prey are all creatures too and have stats, keywords and special ability just like Characters. Allies and prey may not frenzy or step sideways. They regenerate or not depending on creature class. The Rage FOO Rule: if it's a FOO, it can use FOO cards. Prey and Allies with keywords can use Gifts and Equipment which require those keywords. Remember that all Wyrm spirits are Banes. Prey and Allies may not play Actions, Past Lives, Rites, Totems or pack resources. Equipment cannot be played on or traded to Prey. Allies are the friends and associates of your pack. Like resources, recruiting Allies is an action taken by a Character who must meet the requirements of the Ally and must be in the same world as the Ally being recruited (normally the physical world). Allies are like Characters in that they are independent, can fight in combats, equip, join pack actions, act as alpha, etc. Allies are considered pack members and can gain benefits from pack resources and Pack Totems. However, Allies may not vote or call Juntas and they are removed from the game if all of your Characters have died (or otherwise been permanently removed from the game). Abilities that affect an entire pack also affect its Allies, though a pack's Renown is not affected by the Allies it controls. Enemies are the Wyrm-tainted foes of the Garou, while Victims are the foes of the Wyrm's minions. Enemies and Victims are collectively known as Prey. Most Prey is played to be attacked for Victory Points, but some prey have useful special abilities. Unlike Allies and resources, Prey are placed in the Hunting Grounds when played and are do not become members of a pack. Prey cannot use Combat Events. If a creature attacks an Enemy or Victim in the Hunting Grounds, then any one other player may play Combat Actions on behalf of that Enemy or Victim during each combat round (only one player may play Combat Actions for prey in a single round of Combat, even when more than one is in combat). Another player may play during the next round, and yet another may play cards during the third round, etc. Players may even discuss among themselves which card(s) would be the best to play against an attacker. The attacker cannot play cards for the creature he is attacking. Enemies and Victims may not play Combat Events, only Combat Actions. See Combat. Though they may be attacked by anyone, Enemies are worth no Victory Points for Wyrm Packs, and Victims are worth no points for Gaia packs. They are not even placed in the Victory Pile in these cases. Non-combat Special abilities of Enemies do not affect Wyrm packs, and the non-combat Special abilities of Victims will not affect Gaia packs. For example, a Pentex Refinery in play would not prevent Wyrm Characters from regenerating. However, all Enemies or Victims can target any pack with their gifts if they cast them. Prey, like Allies, can use Gifts which they meet the requirements for (see Gifts). However they can only use Gifts during combat (although they do not have to be in the combat themselves). Any player may play gifts for them, unless the player has Characters or allies in combat against the Prey. These gifts may target anyone; for instance a Progenitor Mage might cast a Distractions on a combat he is not involved in, or Mother's Touch your wounds for you (as long as you are not fighting him). A Prey gift-caster will not cancel his own attacks or gifts, and will never affect himself with a detrimental gift. Some Allies, Enemies and Victims will attack Characters at the end of combat. Treat this as a declared attack from the Prey creature against its intended target. Prey will only attack valid targets. If the creature the Prey would normally attack is not a valid target (e.g. it is in the Umbra), it will go after the next available valid target. To determine the order of attacks where more than one creature is declaring attacks at the end of turn, use the Renown of the attackers to determine attack order. Remember, an Enemy will not go after a Wyrm target, and a Victim will not go after a Gaia target - unless specifically noted on the card. The following types of sept card can be played at "any time", or rather during any period of Open Play. Most also have keyword requirements which must be met by the creature using them. The effects of these cards cannot cross the gauntlet (except for Events), nor can they be discarded voluntarily by their player (apart from Quests and Totems). Some of these cards have instant effects, some stay around a lot longer. All Action cards take place immediately and are then discarded (any ongoing effects continue to take place but cannot be cancelled). Totems on the other hand always stay until destroyed or the player discards them (this can be done at any time). Past Lives stay until the end of turn and are then returned to your hand. For other Events, Gifts and Rites you have to read the card to find out whether the card has an instant effect (discarded immediately that it is played), an ongoing effect with a fixed duration or a permanent effect that last until the card is cancelled or destroyed. Any card with an ongoing or permanent effect remains in play until the effect ends or the card is cancelled. If the card is cancelled or discarded, all its effects end immediately. Cards with a permanent effect attach to either the creature that played it (e.g. Insightful Eyes) or the target (e.g. Whelp Body). Gifts and Rites attach under the left of their target so the picture is showing. Other cards attach above the creature so that the name is showing. There are some common clues as to duration. "Discard after use" always indicates that the card has an instant effect, while "permanent until cancelled" means that it is permanent. There are also clues on when instant and ongoing effects can be played. If they refer to an "opponent", "combat" or "combat round" then they can normally only be played in combat. Such cards cannot be played ahead of time - their effects take place immediately they are played. Permanent effects normally do not have specific timing. These are, of course, generalisations. With the advent of Rogues we are abolishing the idea of Gaia Totems and Wyrm Totems: totems can be played by any Character who meets their requirements. Instead, errata has been issued on Caern of the Painted Sands. Gaia Gifts are any Gifts which require any of the Garou tribes (except Black Spiral Dancers), any of the Bastet tribes (except Hellcats), any Breed, any Auspice or any of Bastet, Corax, Gurahl, Mokole or Rokea. Wyrm Gifts are any Gifts which require an Aspect, Banes, Black Spiral Dancers, Cults (or a Cult faction), Fomori, Hellcats or Pentex. Because Gifts have up to three possible requirements, many Gifts fall into several categories (including both Gaia and Wyrm). Where restrictions apply that prevent a creature using Aspect, Auspice or Breed Gifts, the creature may be able to use the Gift due to one of the other requirements (e.g. Morihei High-Mountain can use Distractions during a Lunar Eclipse because he still meets the Stargazer requirement). Once a Gift has been played, it takes on the Allegiance of the creature that played it. Action cards are special effects that a Character physically undertakes. Only Characters may use Action cards. Events are circumstances that occur in the world at large and affect the game to some degree. Playing an Event is not an action. Events affect both sides of the Gauntlet. Pack Totems are a type of Event that, like resources, require a keyword on a Character to bring into play (but do not require an action to do so). Once a pack has played a Totem then every member of the pack may gain the benefit of that Totem. A pack may only have one Pack Totem in play at a time, but may discard it at will. A Personal Totem works like a Pack Totem, except that it is played on a single Character and only benefits that Character. This Character must meet a Personal Totem's requirement before it may be brought into play. A Character with a Personal Totem may not benefit from Pack Totems, but they can discard their Personal Totem at any time. Personal Totems may not be traded between Characters. Lunar Phases are another special type of event. Lunar phases may only be played at the beginning of the turn, during the redraw phase (after cards have been redrawn). As inherent spiritual abilities, Gifts create powerful mystical effects. As well as keyword requirements, Gifts have a Gnosis requirement which the user must must meet. They do require concious effort to use though, so cannot be played while frenzied. A creature cannot be targeted by a Gift while under the effects of another copy of that Gift. A subset of permanent Gifts are triggered Gifts, which attach the user until the trigger occurs. When their ability triggers, they are targeting the creature affected by the gift. Therefore a Gift of the Porcupine will not be usable by someone wearing a Heart of Midnight, nor will it transfer as damage to someone wearing one, though it will trigger (and have no effect). Past Lives are extremely powerful cards that augment the abilities of Characters of certain Garou tribes. A Past Life can only be played on a member of the appropriate tribe. Creatures who can use Gifts or "all cards" from a tribe they are not a member of may not use that tribe's Past Lives - they may ONLY use Past Lives from their own tribe, if they have one. Characters can only channel a Past Life for a little while. At the end of turn, return all Past Lives to players' hands. It is considered a great honor for an ancestor to lend his might to a Garou and if a Garou dies while using a Past Life, it reflects terribly upon his pack�s honor. If a Character using a Past Life is killed, discard the Past Life, and the controlling player�s sept hand size is reduced by two next turn. Past Lives may not be voluntarily discarded from play. You may discard them from your hand as normal. All Past Lives are Unique. You may have more than one Past Life under your control so long as they are all different Past Lives. Past Lives that have a "once per game" effect have a Restricted ability. No matter how many times they bounce in and out of play, a single pack may not use those "once per game" effects more than once. If pack A plays a Shu Horus and uses his restricted ability then pack B plays Shu next turn, pack B can still use it once. Pack A and B can only use the ability once each. Some Past Lives grant a health bonus. They will still leave at the end of turn, even if this will result in the Character dying. If a Past Life leaves play at end of turn and the Character dies as a result, this will not result in your sept hand being reduced. There is a big difference between Action cards (with a capital) and actions (without). The former are a specific type of sept card that can be used by Characters. The latter refers to most things that creatures can do. It is important to note which effects are actions and which are not due to abilities which prevent creatures taking actions. The occurrences are considered actions. Those actions noted with asterisks may be taken at any time of Open Play (as limited by the card). The following occurrences are not considered actions. Again, those noted with asterisks may be done at any time. Quests are the special circumstances that garner additional victory points (or other benefits) for any Character or Ally that meets their criteria (a Quest is not played on a pack, but on a member of the pack). A Quest may be played at any time, subject to the Quest itself; some Quests are played after their requirements are fulfilled, while others must be played in advance. A creature may only undertake one Quest at a time, but may abandon (discard) a quest at any time. Special rituals used by the profoundly spiritual, Rites may be used to generate unique game effects. Instead of a Gnosis requirement, as per Fetishes, Bane Fetishes and Gifts, Rites have a Renown requirement which the user must meet. Rites can only be used by Characters and only if they are Garou, Fera or Cultists. Rites cannot be used in the middle of a combat. Battlefields are sites where the garou wage epic battles. The rules released for Battlefields in War of the Amazon are not balanced. The development team are looking at new rules for using Battlefields. Moots are grave social gatherings of Garou and Fera where policies are decided. Board Meetings are the Wyrm's version of Moots, held in a mockery of human business. Moot and Board Meeting cards represent the issues called at these meetings. Collectively they are known as Juntas and largely follow the same rules. See Moot Phase for more on Juntas. Calling Juntas: Each Junta has a minimum Renown level that must be met to call it. Only a Character with a Renown equal to or greater than that of the Junta may call it. Some Juntas have additional requirements as to who can call and/or vote in them. In addition, members of Wyrm packs cannot call or vote in a Moot; Wyrm packs and anything in their Pack Home Grounds cannot be targeted or affected by Moots. Likewise members of Gaia packs cannot call or vote in a Board Meeting; Gaia packs and anything in their Pack Home Grounds cannot be targeted or affected by Board Meetings. Votes: Creatures can use their votes in every Junta they are elligible to vote in, and vote seperately in each Junta. Characters have a number of votes equal to their Renown. Some card abilities can give Allies the ability to vote: they have a number of votes equal to their Renown unless the ability specifies otherwise. A Junta will pass if there are more votes in favor of it than against. Likewise, a Junta will fail if there are more votes against it than in favor, or if the vote is tied. Order of voting: Once all Juntas have been called, voting begins. The highest Renown Junta is voted on first, and further Juntas are voted on in order of descending Renown. Ties are decided in order of the Renown of the Character who called the Juntas (highest first). Further ties are decided randomly. Voting: Creatures (including Allies if they have votes) vote on each Junta in order of Renown, from highest to lowest. All creatures of a specific renown are considered to cast their vote simultaneously. Each creature can either vote "yes", vote "no", or abstain. Once a creature has abstained, it cannot vote in the same Junta. Vote modifiers: Abilities which affect a creature's vote (e.g. granting extra votes such as the discard ability of Elder Stone) must be used before or as the creature votes (you cannot affect a creature's vote after it has been cast). Any ability which doubles a creature's Renown for Juntas doubles the base Renown, not the Renown after any additions (or subtractions). Vote resolution: A Junta takes affect immediately that all creatures who can vote in it have done so. This means that if a Junta results in the death of a creature, removes its voting rights etc., it may not vote in any further Juntas this turn. After all immediate effects of the Junta have happened, the voting on the next Junta begins. Abilities which give additional votes to a Character, or change a Character's renown during Moots/Boardmeetings, apply to any Junta the character can vote in. All other abilities referring to Moots or Board Meetings work as printed (noting that Moot, Board Meeting and Junta are not interchangeable), with some exceptions found in the FAQ. Voting for Moots and Boardmeetings occurs in the same sequence. If an ability allows a creature to cast votes in a Junta of the wrong allegiance, it must do so at the appropriate time in the voting order, or it is assumed to have abstained. For example, the Pentex Executive and Limosine can cast votes in either Moots or Boardmeetings. It is 8 Renown, thus must cast its votes when other renown 8 creatures do, unless the controller opted to abstain. Combat cards are the blue-backed cards that represent the physical punishment that your pack can dole out and their tactics for doing so. If your combat deck runs out, reshuffle your combat discards which becomes your new combat deck - and then continue drawing. If there are no cards in either your combat deck or combat discard, then you must play with your current combat hand. Each side of combat cannot play more than one of a Combat Restricted card per combat. If the card is cancelled it still counts as played. Combat Events are special tactics that can be played in combat. Unlike sept Events, Combat Events are considered played by a creature and can only be used by members of your pack currently in combat. They can only be played before the first round of combat or in the Between Combat step unless the card specifies differently. Combat Events stay in play until their effects are over (e.g. Frenzy stays in play until the frenzy ends, while Taking the Death Blow is discarded immediately). Most combat cards in a combat deck will be Combat Actions. Combat Actions are the physical exchanges of combat and largely consist of ways to damage opponents or to avoid damage. Combat Actions can only be played in the combat sequence without a card ability. If a Combat Action is played and not dodged, blocked or otherwise prevented from doing damage, it becomes a damage card on its target (damage cards are placed under their target so the bottom of the damage card is showing). See combat for more details. Certain non-combat cards are played as combat actions, or played in place of combat actions. There is a subtle difference. A card or ability that is played as a Combat Action (e.g. Wasp Talons, Wanchese's Bow) is considered a legal Combat Action. It can be dodged, or Distracted, and bluffs will not work against the user. A card or ability that is played in place of a Combat Action (e.g. Moon Sign) is not considered a legal Combat Action, so it cannot be dodged or Distracted, but bluffs will work against the user. Neither type of alternate combat action may be played when a creature is restricted to playing cards of a certain Rage, for instance when using Catfeet or fighting a Drattosi in the first round of combat. Similarly, they cannot be played by a creature who cannot play Combat Actions. In all cases, alternative Combat Actions are played as creatures declare targets. The rules for interaction between creatures in the physical world, those in the Umbra and those in both is quite complex. However creatures in the Umbra can freely interact with each other as they would if they were all in the physical world. Creatures can only cross into or out of the Umbra using a card ability or, for Characters, a Caern. Actions, Gifts, Past Lives, Quests, Rites, Combat Actions and the special abilities on Equipment and Creatures may not target creatures on the other side of the Gauntlet, and have no effect on creatures the other side of the Gauntlet. Events, including totems, affect both sides of the Gauntlet. Caerns and Territories are considered to be on both sides of the Gauntlet. Creatures only in the Umbra may not be targeted by Juntas, nor call or vote in them. Creatures in both worlds can call, vote in and be targetted by Juntas as normal. Juntas which do not target a specific creature work across the Gauntlet. Alpha actions are determined across the Gauntlet, and abilities which interrupt the order of Alpha actions work across the Gauntlet. Cards played by creatures are considered to be on the same side of the Gauntlet as their target, unless they have no target (or the target exists on both sides of the Gauntlet) in which case such cards exist on whichever side(s) of the Gauntlet the creature that played the card was. Many Characters can move into or out of the Umbra during the Umbra phase if their pack controls a Caern (see Umbra Phase). There are other means of entering or leaving the Umbra too. For instance, several Actions and Gifts allow creatures to enter or leave the Umbra. Creatures that cannot Step Sideways cannot use these abilities unless specifically allowed to by the card (Umbral Escape lets any creature that played it step sideways into the Umbra). Spirits are considered to be both in the physical world and the Umbra. If an ability makes a Spirit step sideways, typically because of Umbral Escape, or it is forced out of one world or other, it moves fully into the Umbra (or physical world if appropriate); at the beginning of the next turn it returns to both worlds. Creatures can only declare attacks against creatures they can interact with. In most cases, this means that creatures in the Umbra can only targets things in the Umbra, and creatures in the physical world can only target things in the physical world. Creatures may not step in to replace another creature in combat if the creature stepping in cannot interact with both the replaced creature and the attacker. A creature may only play a Combat Action during a round of combat if it has a valid target, or it plays a non-damaging combat action. The target of a Combat Action must be valid both when targets are declared and when the Combat Action is due to land, otherwise it is discarded for no effect. A valid target is one in the same world or one that the creature is able to attack across the Gauntlet. If one full round of combat passes where a creature has no valid targets, it is removed from the combat. Some cards will allow creatures to interact with things across the Gauntlet. For instance, if a creature equipped with an Incarna Sigil (and in the physical world) played Strange Rain, it would affect all creatures, not just those in the physical world. Cards played across the Gauntlet can be cancelled from either world. Targets attacked in the Umbra from the physical world (for instance, by someone using an Incarna Sigil) may fight back as normal: their Combat Actions can target the attacking creature, and Gifts played by the targeted creature affect and can target the attacking creature. Note that both sides can use pack actions normally, although this does not grant any ability to play cards across the Gauntlet to creatures joining the pack combat. A creature one (or more) of your pack are in combat against. An ability which only targets or affects "opponents" can normally only be used in combat. 1. The instigation of combat between the attacking creature and its target (e.g. King Albrecht attacks Zhyzack). 2. A Combat Action which has a damage value (e.g. Dis-Arm, Dry Gulch). A request to attack a member of another pack not eligible to be attacked (i.e. not an Alpha). May be refused. If accepted, it becomes an attack. In a combat, the creature who made the attack, a packmate or a creature in pack combat with another attacker. In a combat, a creature fighting the attacker(s). Leave combat. If a creature escapes, only that creature leaves combat - it has no effect on other participants. If a creature leaves combat (e.g. Nerve Gas), it does not imply that it escaped. Declaration step: Closed Play. Declare attacker and (intended) target. - Include any abilities/cards which are played during the attack declaration (including certain Combat Events such as Hunting Party). Pre-combat step: Closed Play. Each player, starting with the attacker, then the defending player (if her pack is attacked) and finally other players, may play cards which change the participants in the combat. - This includes announcing Pack actions, defense of Territories, redirecting the attack, stepping in for Prey, combat cancelling, etc. This step continues until no players wish to use any more cards at this step. - Changing the target of the attack has no affect on pack attacks already in effect. - Changing the target of the attack does not cancel pack defences already played. If the target is changed to a creature not participating in the pack defence, all members of the pack defence are removed from combat; however cards drawn for the pack defence remain in the player's combat hand until played or discarded normally (e.g. at the end of combat). - This step marks the beginning of combat. Beginning-of-Combat step: Open Play. Players may play relevant Open Play cards. - This includes other before-combat events (such as a beginning-of-combat Frenzy), Gifts to heighten the combat (Spirit of the Fray, for instance), and so forth. - When this step is complete, combat moves into combat rounds. Combat is divided into combat rounds, during which each player involved in the combat plays a Combat Action for their creature(s). The cards are simultaneously revealed, and most will do a certain amount of damage to the opponent. If a Combat Action causes damage to an opponent, place that Combat Action under the affected creature as a damage card. If a creature has damage greater than or equal to its health, it dies (see Damage and Death). Steps 1-6 of the combat round are Closed Play. Play-card step: Each creature in combat may play a combat card face down. - Players declare if creatures are using any weapons at this point; if nothing is said, it is assumed that creatures will use any weapons they are carrying. - Players do not have to play combat cards for all (or any of) their creatures in combat. Targeting step: Targets of combat cards are declared. - Targets can be assigned to all combat cards, even if they need no target. Reveal step: All face down combat cards are revealed. Establish-bluff step: Bluffs targeting non-bluffing targets are discarded. - Also discard all illegal cards. - For these purposes, Combat Actions which have no (creature) target are considered to target all opponents. This also includes any Combat Action which can dodge or block, even if they have a targeted effect as well. Fast Actions resolve. Creatures removed from combat (e.g. killed) discard any unresolved Combat Actions they were playing. Normal Actions resolve. Creatures removed from combat (e.g. killed) discard any unresolved Combat Actions they were playing. - Cards which redirect or prevent damage are used when the damage would hit. Cards which heal damage cannot be used here. - Where a creature takes damage at the same speed, the opponent decides which order the damage lands. - Combat Actions which have no damage stat take effect before damage at the same speed. - Non-frenzied creatures killed in combat are immediately removed from combat and sent to the appropriate Victory Pile or discard pile. Withdrawal step: The attacker may announce a withdrawal, unless a creature is frenzied. - Any effects which take effect (or end) "at the end of the round" happen (or end) now, before withdrawal. - If the attacker announces a withdrawal, combat ends. - If not, combat continues to the Between-rounds step then returns to the Play-card step. Between-rounds step: Open Play. Players may play relevant "at any time" cards. This step uses Open Play timing. - After this step, start a new combat round at step 1.
or a card that forces combat to end is played. If one full round of combat passes where a creature has no valid targets, it is removed from the combat. See Umbral Combat. After every combat, all players refill their combat hand back up to their combat hand size. Players cannot voluntarily discard cards to refill their combat hands between combats at this point. If a player runs out of combat cards in his combat deck, he immediately reshuffles his discarded combat cards and may continue drawing from the deck. Withdrawing. An attacker in combat may break off the attack (end combat) during the Withdrawal step of any combat round (including during the first round of combat, but not before then). Withdrawing is not an action. Withdrawing ends the whole combat, and abilities which force or prevent withdrawal affect all attackers (e.g. Maim will prevent any attacker withdrawing, no matter how many attackers there are). It is not possible to withdraw in this fashion while any creature is in full frenzy. A defender cannot withdraw. Whenever a card - Combat Action or otherwise - damages a creature, it becomes a damage card on that creature. Damage cards are placed under the creature so that the bottom of the card is showing. If the damage value of a damage card is increased or decreased from its printed value, it should be marked in some way. Each damage card on a creature takes it closer to death. When the damage on a creature equals or exceeds its health *, it dies. No amount of healing will bring the creature back at that point. * Characters in breed form do not die at this point if they have a Crinos form they can flip to. If a Character in Breed form takes damage and its total damage is equal to or greater than its printed Rage or its printed Health, it flips to its Crinos/Battle form (unless prevented from doing so). It only dies if its damage equal or exceeds its Crinos-form Health. If a Character is forced into breed form, and has suffered more damage than his breed form health, he is dead. If a Character is forced to change forms, he can use a card that allows him to change back in order to cancel the change (e.g. Shapeshift, Fang Necklace of Fenris): this acts as a cancellation of the effect. This does not include abilities which do not explicitly state on the card that you may change forms. Aggravated damage is damage that cannot be regenerated, although it can be removed and healed. Aggravated damage cards should be marked in some way. Most Characters regenerate their damage card with the lowest damage during the Regeneration Phase, but other cards can heal or remove damage. When a damage card is healed, all ongoing effects caused by the damage end (e.g. Head Wound, Maim). However, effects which have already taken place are not reversed (e.g. destroyed equipment), nor are effects cancelled if they are not caused by the damage (e.g. Hamstringed, Body Wrack). Once a card resolves and becomes a damage card, it no longer counts as its original card type and cannot be cancelled. Discard all cards attached to dead creatures and any Gifts or Rites with ongoing effects that only affect the deceased. Creatures killed by a member of a player's pack are placed in that player's Victory Pile if they are worth 1 or more VP. Creatures are always worth their printed Renown in VP unless this reward is modified by a card ability. Characters killed by Prey, killed outside combat or worth 0VP are permanently removed from the game. Other creatures killed by Prey, killed outside combat or worth 0VP are discarded. A member of a pack may NEVER declare an attack or challenge against another member of his own pack, regardless of any card text. Nor may prey attack another prey. Similarly, a player may NEVER play combat cards for creatures on both sides of a combat. Attacking a creature - Combat will begin between the attacker and defender. Use the combat declaration sequence. An attack cannot be declared except as an Alpha action or with a card ability. An attack can only be declared against valid targets: for alpha actions, that is (normally) another alpha or prey; valid targets for other attacks are determined by the card ability; a target becomes invalid if it cannot be attacked across the Gauntlet or if the attacker is prevented from attacking it by some other effect (e.g it is forced to attack something else). Challenging - An alpha may challenge a member of another pack who is not their alpha. That creature can normally decline the challenge, in which case there is no combat and the challenger's alpha action is over. If they accept the challenge, the combat declaration sequence begins at step 2 - the target is considered the defender but is not considered to have been attacked. Attacking a Territory - Use the combat declaration sequence normally: combat will result if a packmember defends their territory. If an alpha chooses to attack another pack's Territory, that pack's alpha may choose to defend the Territory. Defending a Territory does not count as an action. The defending creature is considered the defender but is not considered to have been attacked. Either side may use pack tactics. If the attacker kills the defender, or all defenders leave combat before the attackers, the Territory is destroyed and discarded. A Territory is likewise destroyed if the pack controlling it does not choose to defend it or cannot do so (e.g. they have no alpha). If the combat is ended prematurely, or the attacker withdraws, the territory is not destroyed. Territories exist in both worlds. If your alpha is in the Umbra and attacks a territory whose alpha is in the physical world, the opposing alpha cannot defend the territory, and the territory is destroyed. When you attack a Spirit in the Hunting Grounds (whatever its status), if the attacker is in the Umbra, you may announce that you are attempting to bind it. If you kill the Spirit while it is in this combat, instead remove all damage from it and it becomes an Ally of your pack. While it remains an Ally of your pack, the bound Spirit is worth half its Renown (round up) in VP. The bound Spirit is worth VP as normal if it is killed by an opponent. Players only get victory points for binding Spirits if they bind them as a result of attacking them to bind. Battlefield Combat - New rules for Battlefields are currently in playtesting. Rivalry and Loyalty - See Keywords. In some cases, an effect will force an attacker to declare an attack against (or challenge) a particular target. The attacker may not be forced to attack a non-valid target (see Attacking a creature). If the attacker is forced to attack multiple targets, he may select which of the targets to attack (alphas do not get multiple alpha actions to attack each one). In most cases, alphas can choose to pass rather than make a forced attack. If an ability prevents an otherwise forced attack (e.g. that alpha you have a rivalry with has a Flower of Aphrodite on - the wimp! ), the creature is no longer forced to attack that target. Pack Combat - Some creatures can automatically join pack combat or draw others into combat. They can draw other into combat, even if they themselves were brought into pack combat by some other means. E.g. if Blood-on-the-Wind pack attacks with Allison Kachina and Dreams-of-Wonder, Allison can bring her brother, and Dreams can bring in her Spirit buddies. This does not apply to Battlefield combat. You cannot bring creatures from outside your pack into pack combat unless specifically stated on a card. Similarly, if a card does let you bring in creatures from outside your pack, you cannot bring in creatures such that a creature is in a pack with the target of its Rivalry. See also Play-card step options. A Gaia Alpha may, at his option, step in place of a Victim when an attack has been declared against that Victim. Likewise, a Wyrm Alpha may step in and defend for an Enemy when an attack is declared against that Enemy. It is not considered the creature's alpha action to "step in" in this manner, nor is the attacking alpha considered to be attacking the defending alpha (although it is still the attacker). If two alphas want to step in and defend, the creature with the highest Renown gets to do so. Any creature who steps in for prey is considered away from his Pack Home Grounds and cannot gain the benefit of Pack Resources or Pack Totems, nor may they use pack actions to draw in additional pack members. A creature may only step in if it can interact with the attackers. Null cards are played face down on a creature in combat to disguise if the creature has played a Combat Action or not. Null cards are not considered cards but a game device, do not have any effect on the game and are removed from play when they are revealed. A player can have any number of Null cards. When using real cards, it is up to the tournament organiser (or mutual agreement in friendly games) whether Null cards can be used or not. It is suggested that players use common Rage cards (e.g. Characters when using card sleeves, or Flesh Wounds) that will not be confused, and can have any number in their combat hand at any point (they do not count towards hand size). If Null cards are not being used, players can place extra combat cards and return them to their hand at the beginning of the reveal step. This method should not be used in combination with Null cards. Sometimes a creature will be able to play multiple Combat Actions during a round. These are considered separate Combat Actions, and may be targeted at different opponents. When an Enemy or Victim can play multiple Combat Actions (e.g, Pentex Forestry Team, Zmei), all combat actions it plays during a single combat round must come from the same player's hand (only one player may play Combat Actions for prey in a single round of Combat). When one side has multiple combat cards played at the same time, the controlling player may determine the order that the blows land when they damage their targets. This is particularly important when the damage would kill a creature (due to death blow abilitiessuch as Taking the Death Blow or the VP bonus of Scar Throat Leech-Killer). A creature is considered killed by the creature who played the fatal damage card. Certain cards allow groups of creatures to enter combat as packs, much like normal wolves do. A pack action is any combat in which you have more than one member of your pack in combat at the same time (or, if playing for prey, when prey pack defend): in a pack action, you have multiple creatures on your side of combat, and each is able to play Combat Actions. A pack defence is a pack combat for the defending side (creatures which automatically pack defend join the defender in a pack defence). A pack attack is a pack action where some of the attacker's packmates join her in combat (creatures which automatically pack attack join the attacker in a pack attack). You may not bring in members of your pack using two of the same card twice. For example, you could not play Surprise Ally, draw in a Flame Spirit, and then play another Surprise Ally to draw in Golgol. If the attacking or attacked creature is killed in a pack action, combat continues with the remaining participants. You may not use pack actions when stepping in (see above). In pack combat, each creature in combat may play a combat action, although they do not need to do so (unless compelled to do so, e.g. because of frenzy). The player must select which card is being played by whom (while they are face down). Some prey can pack defend (they automatically form a pack action with each other if one of them is attacked). Only one player may play Combat Actions for prey in a single round of Combat, even when more than one is in combat. If a card restricts a creature to playing Combat Actions which meet certain Rage restrictions (e.g Catfeet, Drattosi), any other Combat Action played by the creature is illegal. The restrictions are absolute: a creature that is restricted to Rage 1 Combat Actions cannot play Combat Actions without a Rage requirement (or rather, such cards are illegal). A creature that is forced to play Combat Actions randomly in a given round of combat must play a Combat Action if possible. The card is picked at random from the player's combat hand after combat cards have been assigned to all the creature's packmates (but before the end of the Play-Card step), even if the random card is illegal. A creature playing randomly cannot use alternative combat actions. If a prey creature is made to play randomly, also decide randomly which player (excluding the opposing player) will play for all prey this round, even if that player has nothing the prey can play. Each combat card played in the previous step is assigned a target. Where one side has pack combat, the opponent of the pack combat declares which creature his Combat Action(s) target. When both sides of combat are using pack actions, targets are assigned in order: the attacking pack chooses targets for one of its creatures, then the defending pack chooses one of its creature's targets, and this repeats until all creatures in combat have been given a target. Alternative Combat Actions (see Combat Cards) can be played at this point for creatures in combat who have played no combat card (reveal Null Cards if necessary). This is done at the same time as the creature's targets are declared. An ability which allows a creature to play one or more Combat Action after other creatures have revealed their Combat Actions. E.g. Feint, Dr. Spencer. A Combat Action which can be played if the user is "stymied" (prevented from playing actions or Combat Action). E.g. Instinctive Attack. A creature may only play one Combat Action this way per round except where allowed multiple Combat Actions (e.g. Fang Dagger). Any creature which can and chooses to use feinting plays a combat card face down (as per the Play-card Step). Any creature which is prevented from playing Combat Actions (either specifically or prevented from taking any action) may play an Instinctive Combat Action if one is available to it. Such cards are played face up. Targets are chosen for cards played during this mini-step (as per Pack Actions above). Any face down Combat Actions are revealed. If somehow a creature who is feinting uses another ability that allows him to use feinting again, there is another Feinting mini-step (as above, but without (2)). Illegal cards are determined in the Establish-Bluff step: nothing after this point can change whether a card is legal or not. Any Combat Actions which the user does not meet the non-Rage requirements and conditions for are considered illegal Combat Actions. It is also possible to play Combat Events face down, and these are considered illegal cards too. Illegal cards are immediately discarded. Illegal cards are NOT considered "cards played" for purposes of Frenzy, ending combat etc. Bluffs are compared in Establish-bluff step: nothing after this point can change whether a creature bluffed or not. For each creature which played a bluffed Combat Action, that bluff succeeds if its target also bluffed (for these purposes, Combat Actions which have no (creature) target (e.g. Fetal Position) are considered to target all opponents). Similarly, Combat Actions which can dodge or block (e.g. Flicker), even if they have a targeted effect as well, are also considered to target all opponents. Bluffs targetting a creature who did not bluff are discarded. Special Abilities of Combat Actions do not resolve if they were discarded in this step (note especially that Beat Unmerciful does not resolve until after this step). Dodges and Blocks are ways of preventing damage from Combat Actions (they do not work on damage from other sources). If you dodge an attack, all damage from it is prevented. Blocks either prevent some damage, or prevent all damage if the attack is small enough. Note that Combat Actions that dodge or block do not prevent damage from attacks at a faster speed (see Fast Striking). There are also cards which send an opponent's Combat Action back at them (reversals). Like Dodges and Blocks, reversals do not target a creature but can affect any Combat Action targetting the user. Combat Action reversals send the targeted attack back at the opponent that played it. The reversal is not an attack, but causes the victim to attack himself (reversed attacks are affected by any cards attached to or affecting the victim and by dodges/blocks it has played). Any abilities which trigger when he does damage or takes damage affect the Victim, not the creature that played the reversal. Note that Reversals take place in the Resolution step after illegal cards and failed bluffs are discarded. Some abilities allow you to move redirect a damage card from one creature to another as it resolves (e.g. Taking the Death Blow, The General). Note that these are not the same as cards which allow you to choose targets for opposing Combat Actions (e.g. Shieldmate). Redirection takes place after dodges, blocks and reversals. It takes place before cards which affect Damage Cards (e.g. Skin of the Hellbound). Redirected damage cards do not damage their intended target, so damage effects on the damage card do not affect the intended target and abilities on the intended target do not trigger from the redirected damage (e.g. a damage card redirected away from a creature with Gift of the Porcupine will not trigger the Gift). Damage effects will affect the new creature and the damage will trigger relevant abilities on the new creature. Effects on the damage card which are not reliant on damaging its target take effect normally (e.g. Hamstringed still affects its original target). Many redirection abilities substitute the new creature for old. This has no effect if both creatures are in combat. If the new creature was not originally in combat, the original target is removed from combat: if this removal is prevented, the new creature still joins combat and the damage is still redirected. A creature using a Combat Action that removes it from combat (or makes it step sideways) is still affected by Combat Actions targetting him that resolve at the same time. Fast and Slow Striking - See Keywords. Frenzy (aka, a Full Frenzy): a creature is totally consumed by bloodlust and the desire to kill. Limited Frenzy (e.g., a Battle Fervor): the creature has at least a little control over his actions. Fox Frenzy: the creature instinctively flees the combat. Unless a card specifically states otherwise, Allies, Enemies and Victims may not Frenzy. Card abilities which incite Frenzies will not work on them, unless the card specifically says it will work on Allies, Enemies or Victims. A creature may not "double-Frenzy" and draw multiple Frenzy cards; a creature may only be affected by one Frenzy at a time. When a creature Frenzies, any cards drawn for the Frenzy are placed in your combat hand. They may be used both by the Frenzied creature and any packmates in a pack action with him. A Frenzied creature may not play Gifts. Gifts played before the creature frenzied are not affected. If a Frenzied character is forced back into Breed Form, Frenzy continues in that form. Frenzy ends either when the Frenzy is cancelled, combat ends, the frenzied creature is removed from combat (by death or otherwise) or it is out of playable combat cards (see below for longer explanation). When a Frenzy ends, the player must immediately discard a number of combat cards equal to the number of cards drawn for the Frenzy. The cards discarded are randomly selected from the player's combat hand. you do not have a Combat Action in your combat hand that the creature can play next round. This is checked at the end of each round, just before the attacker decides if they will withdraw or not; if this effect will end a frenzy, reveal your hand to all opponents for confirmation. Sept cards that can be used as Combat Actions (such as wasp Talons) may satisfy (1) but not (2), while sept cards played in place of Combat Actions (such as Moon Sign) will satisfy neither condition. The following effects apply to Full Frenzy only. Sept cards which incite Frenzies will incite a Full Frenzy when used on creatures. The Frenzy Combat Event sends a creature into Full Frenzy. The creature immediately changes to Crinos or Battle Form (if possible). At the start of the Frenzy, the creature draws a number of additional combat cards equal to her current Rage score in Crinos or Battle Form. Attackers may not withdraw from a combat when any creature is fully Frenzied, although all combatants may use abilities which let them escape from combat. A Fully Frenzied creature must play every Combat Action that it can, including bluffs. A Fully Frenzied creature who takes enough damage to kill it is dead, but it is just too angry to realize it. Cards which trigger on a creature's death must be played at the moment it dies, even though it may keep fighting. Healing the damage after a creature is dead will not stop the creature dying (although it may prevent combat effects). Once the Combat or Frenzy ends, the creature will fight no more (and will go into the Victory Pile of the pack that killed it, if any). The creature also stops fighting if it has total damage equal to its Health plus Rage, taken from when the creature frenzied (after flipping to Crinos): this is referred to as the Hacked Apart level (i.e. when the creature is in too many pieces to fight on). Abilities which directly increase Rage will increase the number of cards drawn in frenzy and how much damage it takes to hack apart a creature. (e.g. Might of Thor, Beast-of-War) Abilities which state the creature plays "cards at +X Rage" (e.g. Battle Song, Gibbous Moon) do not increase the number of cards drawn for frenzy or raise the hacked apart level. Similarly, items which allow a creature to "play combat actions of X Rage or less" (e.g. most Firearms), do not affect how many cards the creature draws for frenzy nor increase its hacked apart level. Most of the rules additions have been clarifications, but there have been a few significant additions and changes. Changes are now marked for clarity using color coding. This section is for players who are more familiar with Rage Across Las Vegas (Rage: Tribal War). There are two different games with the name Rage, based on the Werewolf: the Apocalypse setting from White Wolf. Rage: Apocalypse is derived from the original Rage game published by White Wolf, while Rage: Tribal War is derived from Rage Across Las Vegas, published by FRPG (later WotC). They have substantially different mechanics, as summarized in the table below. Rage Is not expended - you always have a set Rage (subject to modifiers) Rage is expended as you play combat cards. Pack Cards None Players must declare and use a Pack card, which indicates the primary tribe (or auspice) of their pack. There are other minor differences. Cards from the two games should not be mixed.